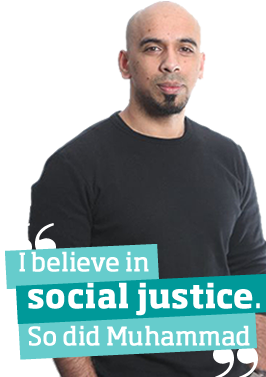 Social justice was a term coined in the 1840s and is a guiding principle for all societies today just as it was fourteen centuries ago in the Arabian desert. Society’s wellbeing was paramount to Muhammad who taught that all humans were entitled to the same rights and privileges. "People are as equal as the teeth of a comb," he said, and he practised what he preached. Muhammad was a social activist of his time. He shook the underpinnings of the unjust society he lived in by bringing about social reforms: he forbade exploitation of the vulnerable, protected the poor by establishing regular charity; and crippled an arrogant class and race-based system by upholding equality. Welfare and social solidarity are the basis for the progress of a nation. The Islamic civilisation pioneered the implementation of social welfare by establishing institutions to provide support to individuals in all levels of society in a trust system known as waqf. There were institutions for the disabled, the blind, and those in need who would find shelter, food, and education. There were also institutions for mothers of young children – one of Salahuddin’s (Saladin) greatest acts of philanthropy was the establishment of two reservoirs by the gate of his fort in Damascus – one of milk and one of fresh drinking water for the mothers to take freely. Muhammad said: "The best people are those who are most useful to others" and today Muslims still aspire to that maxim through participating in social and community projects. From supporting the homeless in London to working with children with learning disabilities, British Muslims are actively involved in making their communities better for everyone. “As a frontline worker in a homelessness charity, I come face to face with the raw problems vulnerable young people are confronted with every day. My faith tells me it's impossible to ignore the suffering of a hungry person on the streets. Even when I was young, I was one of those kids who wanted to change the world. Changing the world for the better is definitely the most enduring lesson I have of Prophet Muhammad. We are told that he was sent as a "mercy to mankind". For millions, the man and his message were about hope and change – despite all of the hardship and suffering he endured, his life was lived with unflinching optimism. When I work with young people in London, I try and encourage them to see their lives with greater optimism, find hope where there was despair.